Hitachi 50HYT62U review | What Hi-Fi? The world of TVs is not very big. That is, it’s usually the same names that keep popping up in our testing rooms. Imagine our surprise, then, when we receive an Hitachi TV for the first time since 2011. A deep dive into the archives of What Hi-Fi? reveals a grand total of two Hitachi TVs. The company really ought to visit more often. But first, let’s clear something up. This is not made by Hitachi the Japanese manufacturer, but rather the Turkish company Vestel. In the UK, Hitachi products are sold exclusively through Argos. Vestel also makes Finlux TVs, and Finlux has a decent track record, so we are hopeful. Especially when we look at the price tag. A 50in Full HD model for £380? Yes please. However, these hopes are soon dashed. The Hitachi 50HYT62U (known at Argos by the snappy title ‘Hitachi 50 Inch Full HD Freeview HD Smart TV 262/9881’) is not the tempting proposition it first appears to be. First impressions are not great. There’s a lot of plastic, which was the norm a few years ago, but things have moved on now and a bit of metal would be nice. It’s not very well endowed in terms of features, either: two HDMI inputs and two USB ports, and a fairly basic smart interface. Netflix, YouTube and BBC iPlayer are on board. Navingation isn’t a great experience. The remote control features a bunch of icons, although because it is not immediately obvious what they do, the result is a fair amount of trial and error. However, the build quality is solid enough, and of course what really matters is whether the performance is up to scratch. But sadly, it is not. It is a sharp picture, it’s true ­– but artificially so. The processing seems a little too zealous, resulting in an image that looks unnaturally etched. We find ourselves having to turn down the sharpness to compensate, but there’s only so far you can go before you jump from ‘weirdly crisp’ to ‘kind of blurry’. This Hitachi’s strongest trait is its contrast, which is acceptable if not particularly impressive. The dynamic range is decent, and there is enough of a gap between the brightest and darkest levels. That said, the whites don’t dazzle and shadow detail is murky. Colour balance, at least, is fairly convincing. And that’s the Blu-ray performance. 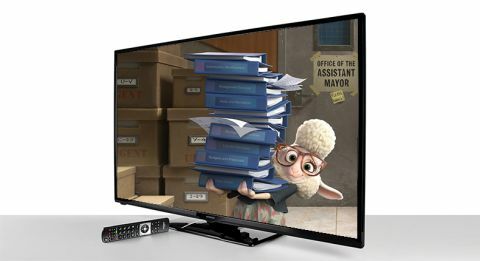 Switch to DVD for standard definition and there’s the usual dip in definition and rise in picture noise, but we’ve seen rivals (such as its Finlux 43UT3E310B-T stablemate) offer better upscaling with less grain. So it’s not the best picture, but it is the sound that really disappoints. Or rather, it offends, because it is shockingly bad. In fact, this may be the worst-sounding TV we’ve heard in years. There is no bass to speak of, and we’re not certain there’s much in the way of midrange either. Mostly treble, then, and it’s so harsh it borders on shrill. If you plan on getting this TV, we recommend, nay demand, you invest in a soundbar. Should you buy the Hitachi 50HYT62U? Only if picture and sound quality is less important to you than that 50in screen size. You could do a lot better with your cash.